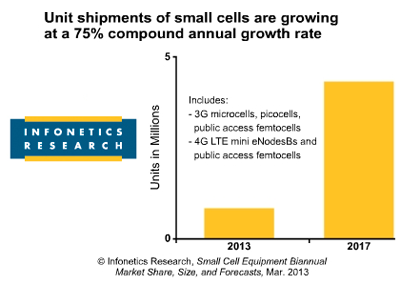 The global small cell market to grow from a very small base now to $2.7 billion by 2017, according to a new forecast from Infonetics. Given the current pace of LTE rollouts worldwide, 4G small cell shipments are anticipated to overtake 3G shipments by the end of 2013. South Korea’s SK Telecom has deployed close to 40,000 small cells and is the leading adopter of 4G public access femtocells to date. Backhaul is no longer an inhibitor to small cell growth, but could remain an issue depending on factors such as location or mobile operator. Geographically, Infonetics expects Asia Pacific to lead the small cell market in 2013 with 50% of all units shipped, followed by EMEA with 34%, and North America with 14%. Apple's data centers are now 100% powered by renewable energy. In a blog posting last week, Apple announced that its flagship data center in Maiden, North Carolina, boasts the nation’s largest end user–owned, onsite solar photovoltaic array -- a 100-acre, 20-megawatt (MW) facility with an annual production capacity of 42 million kWh. Apple is currently building a second 20-MW solar photovoltaic facility on nearby land that should be operational in late 2013. Apple has also built an onsite 10-MW fuel cell installation that uses directed biogas and provides more than 83 million kWh of 24/7 baseload renewable energy annually. In total, Apple will be producing 167 million kWh of onsite renewal energy. The Maiden data center has earned LEED Platinum certification from the U.S. Green Building Council. Apple's older data center in Newark, California is now using 100% renewable electricity sourced from wind farms in California. New data centers under construction in Prineville, Oregon and Reno, Nevada will also use renewable energy. Apple has acquired WiFiSlam, a start-up developing indoor location tracking technology, for $20 million, according The Wall Street Journal. WiFiSlam is based in Palo Alto, California.